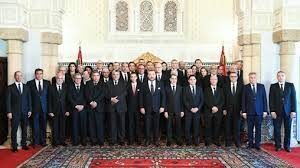 After five months of deadlock and few weeks of suspense, a coalition Government came into being Wednesday and its 39 members were sworn-in at a ceremony in Rabat chaired by King Mohammed VI. The 39-member Cabinet, led by the moderate Islamist Party for Justice and Development (PJD), is composed of the National Rally of Independents (RNI) and Constitutional Union (UC), both liberal parties, the traditionalist Popular Movement (MP) and the leftist Party for progress and Socialism (PPS) and Socialist Union of Popular Forces (USFP). Twenty members of the new Government of Saad Eddine El Othmani were part of the outgoing cabinet, including eight PJD ministers (Mostafa Ramid, Mustapha El Khalfi, Mohamed Najib Boulif, Aziz Rabbah, Abdelkader Amara, Jamila Moussalli, Lahcen Daoudi and Bassima Hakkaoui), four RNI ministers (Aziz Akhannouch, Moulay Hafid Elalamy, Mohamed Boussaid, and Mbarka Bouaida) and three PPS ministers (Nabil Benabdallah, Lhoussaine Louardi and Charafat Afilal). Leaders of three political parties were positioned at the helm of mega-ministries. These are RNI’s Aziz Akhannouch who holds the Ministry of Agriculture, Fisheries, Rural Development and Water and Forests, PPS’s Mohamed Nabil Benabdallah, who was appointed Minister of National Planning, Urban Planning, Housing and Urban Policy and UC’s Mohamed Sajid, appointed Minister of Tourism, Air Transport, Crafts and Social Economy. The Ministries of Culture and Communication have been merged and the new portfolio is held by Mohamed Laâraj, author of nearly twenty books and dozens of papers and analyses. The cabinet also includes technocrats, i.e. ministers without political affiliation. These are Mohamed Hassad who leaves the Interior Ministry to head the Ministry of Education, Nasser Bourita who has been promoted from Junior Foreign Minister to Minister of Foreign affairs and International Cooperation in replacement of Salaheddine Mezouar, as well as Ahmed Toufiq and Abdellatif Loudyi, who keep the portfolios respectively of Endowments and Islamic Affairs, and of the Administration of National Defense. Driss Dahhak was replaced in the position of Secretary General of the Government by Mohamed El Hajjoui. The El Othmani Government includes nine women, i.e. three more than in the outgoing cabinet formation, but only one, Bassima Hakkaoui, holds the position of Minister (Women, Family and Solidarity), all her other female colleagues are Junior Ministers or Secretaries of State. Besides Hakkaoui, Mbarka Bouaida, Charafat Afailal and Jamila El Moussali were part of the outgoing Government, while Lamia Boutaleb, Mounia Boucetta, Nezha El Ouafi, Rkia Derham, and Fatna El Khiyel are new comers. The participation of six parties in the new coalition gives the El Othmani Government a comfortable majority of 240 seats out of 395. The opposition, to be led mainly by the liberal Party for Authenticity and Modernity (PAM/102 seats) and the conservative Istiqlal Party (PI/46 seats) will find it hard to challenge the governmental coalition. Written by: Jaber Ali on April 6, 2017. Posted by Jaber Ali on Apr 6 2017. Filed under Headlines. You can follow any responses to this entry through the RSS 2.0. Both comments and pings are currently closed.